1.Prepare Chicken Salad: Prepare outdoor grill for direct grilling over medium heat. Spray chicken with nonstick cooking spray; sprinkle with salt and pepper. Place chicken on hot grill rack; cook 10 to 12 minutes or until chicken loses its pink color throughout and internal temperature reaches 165°, turning once halfway through cooking. Transfer chicken to cutting board; let cool. Cut chicken into 1-inch pieces. 2.Prepare Greek Dressing: In medium bowl, whisk together garlic, vinegar, yogurt, oregano, salt and pepper; slowly drizzle in oil, whisking constantly. 3.To serve, in large bowl, toss remaining ingredients with dressing. Makes about 10 cups. Omit the chicken for a flavorful vegetarian dish. 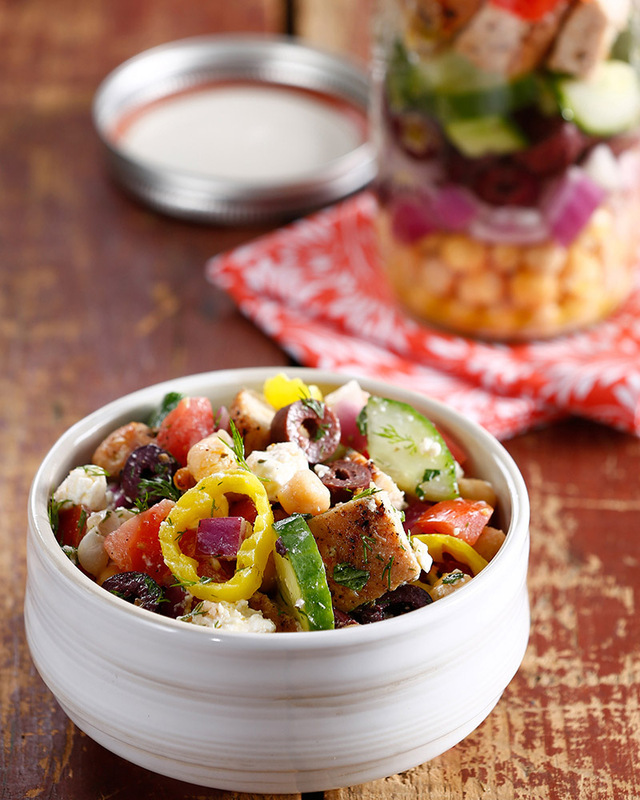 For on-the-go salads, layer ingredients in 24-ounce Mason jars in the following order: beans, dressing, onion, olives, cucumber, chicken, tomatoes, cheese, pepper rings, dill and mint. Cover and refrigerate up to overnight. Shake jars to distribute dressing just before serving. > Add whole grains to this salad by mixing in cooked quinoa.